Victoria Studios it's a nicely renovated building inside the UNESCO Heritage Site of Porto's downtown steps away from the most interesting sightseeing spots like Torre dos Clérigos, Livraria Lello and Galerias de Paris. The location is priceless, in a very quiet street surrounded with locals and a few minutes from one of the most vibrant neighbourhoods in the city, Galerias de Paris, with beautiful shops, cool bars and lovely restaurants. Some of our studios have balconies with lovely views, check their description before you book or contact us if you need some help in choosing. All units are equipped with air conditioning, for both cooling and heating, and Wi-Fi. The property is quite flexible with check in and check out times, please get in contact before arrival. They also provide space to leave your luggage safe in case you need. The neighbourhood it is a UNESCO Heritage Site, very picturesque and typical, narrow streets up and down the river. Moreover, because of that most of the best sightseeing spots are reachable by foot. Porto it is a beautiful city to do a walk. The street it is very quiet, there is no bars and a few small restaurants, but streets away you are surrounded with great bars, excellent restaurants and cool shops. Galerias de Paris area is just 3 min walking from the studios. All the studios have similar commodities, a well-equipped kitchen and a complete bathroom. Every unit is independent and we provide towels and sheets, so the studios will be presented as they are shown in pictures. You will have a warm welcome, we will be here waiting for you to show you your studio, and we always have time to seat with you to tell you the little secrets of the old town. Please inform your arrival time. Check-in time must be arranged beforehand. Guests that ignore our contacts by email or phone will have their reservation cancelled. 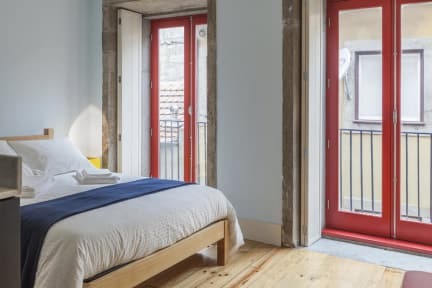 It'll be charged upon arrival the Porto City Tax of 2€ per night and per person (up to a maximum of 7 nights). Our check-in time is till 10 pm, is possible to schedule a late check-in but will have an extra cost of 25€. For every reservations made from 1st of July'18. Breakfast not included. Not served. Please inform your arrival time. Studios are not suited for children. 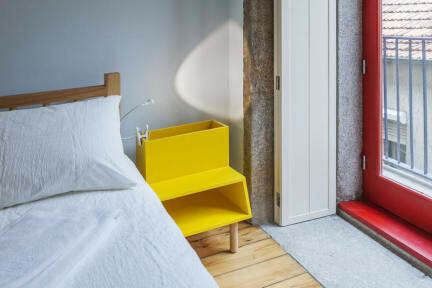 This was the perfect studio in the middle of Porto. Everything is at a walking distance. The staff gave us very good recommendation for restaurants and answered all of questions. Great little tapas place next street on Rua dos Caldeireiros 164 - Clérigos Bar wine and tapas bar. Great studio apartments in an excellent location, easy walking distance to the historic old town and main train station. The rooms were clean and bright, with a good electronic key-card system for coming and going as you like. The staff were friendly and very helpful. Recommended for great value for money accommodation! We had an amazing time at our clean, well furnished and well located flat in charming Porto. The host was such a great guy. He spent so much time helping us get the best out of the city, and giving us recommendations special for our interests. I would deeply recommend this place to any future traveler. Great place, brilliant location for a good price. Excellent views from the penthouse studio. Facilities were excellent. Bathroom on the small side but this was not a problem. Great location, friendly staff and nice rooms - would visit again! Great central Location! Modern and nice facilities! Only downside was the noise. You can hear absolutely everything. I understood every word of the phone conversation of the man one floor up as well as the party music of a fair one block away until 3am.